Here you can find a strain description about Promiscuous Kush and also some user-based reviews and infos directly from the SeedFinder (if available). You can also find the offers and auctions here if Promiscuous Kush cannabis seeds are on stock at MyCannapot right now. 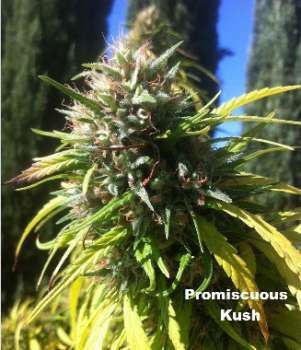 Promiscuous Kush 30-32% THC Plant Structure: Kush / Single leaf mostly Medium Light Green Sativa Hybrid Strong Head Euphoria: 3-5 hours per dose Body Feeling: Numbing to first time user’s Medical Uses: Day Time Alcoholism, Mild Opiate Addiction, Bad Nightmares, Suicidal Thought’s. Serious Medical Compound’s.. Not for the Faint at heart… Enjoy! Buy Promiscuous Kush now at MyCannapot!